Hey, I consider this my first very own cookie creation!!!! I am very proud of it! It's been developing in my head over the last week, after I bought a package of coconut powder. So there was one ingredient set. Ever since I had cookies that contained cooked beans, I wanted to explore this a little more. How much healthier can a cookie become: you have your legumes with your tea. I think that's really cool. And that's basically it: I threw cooked beans and coconut powder together, added some dried fruit (and very little sugar) and put a nut on top. I am telling you: they are yummy! Have a try and let me know if you liked them. Pulse the beans, oil, sugar, egg, and vanilla extract in the food processor to a smooth and creamy paste. Soak the raisins in warm water for 10 minutes. Then drain. Add the chopped apricots and raisins. Combine wet ingredients with the dry ingredients. Make little balls out of the dough (approx. diameter 2-3cm), by rolling them between your palm. Flatten each ball, so it gets the shape of an ice-hockey puck. Leave some space between the cookies on the baking sheet. They spread a little while baking. 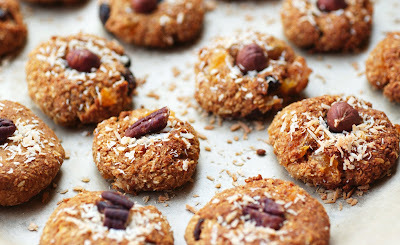 Garnish the cookies by sprinkling some coconut powder over them. 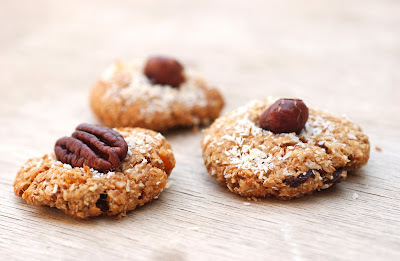 Put a hazelnut or pecan on each cookie.